Huge Savings Item! Save 16% on the Wrapables Macho Man CD Holder, Lifting by Wrapables at RVTE. MPN: A53246. Hurry! Limited time offer. Offer valid only while supplies last. CDs piling up and scattered everywhere, Macho Man to the rescue. Depending on which you choose, he'll Lift, Push or Climb his way to CD organization. CDs piling up and scattered everywhere, Macho Man to the rescue. Depending on which you choose, he'll Lift, Push or Climb his way to CD organization. 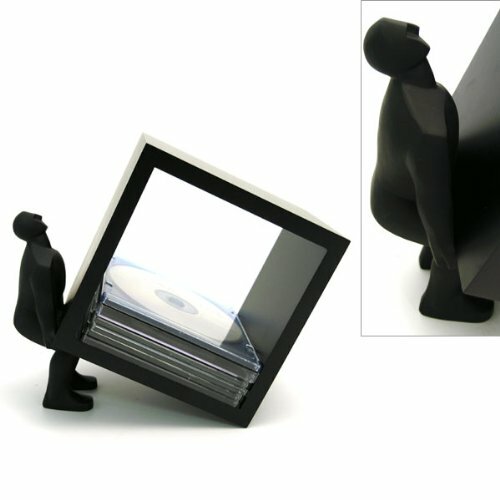 Each CD Holder features a human figurine, we like to call him 'Macho Man' positioned to take the stress off of organizing your CDs. Choose from Pushing, Lifting and Climbing. Each sold separately. Pushing measures 4.7 x 20 x 7 Inch. Lifting measures 4.7 x 9.5 x 8.25 Inch. Climbing measures 4.7 x 20 x 9 Inch. Climbing can also be hung on the wall. View More In Media Storage. If you have any questions about this product by Wrapables, contact us by completing and submitting the form below. If you are looking for a specif part number, please include it with your message.